blog – Java, SQL and jOOQ. A fun, not so serious parody on what is being discussed on reddit’s /r/programming. Hint: Bikeshedding topics are the most popular. Like this one. That was so meta! This is a really interesting article about not-so-common advice that might be handy every once in a while. We’re surprised ourselves that this is so popular. But it appears that we’re really well ranked on Google when people are looking for ROW_NUMBER() and DENSE_RANK(). And the trick is very useful, of course! This is an interpretation of a popular ranking of (R)DBMS, showing that even if Oracle, MySQL, and SQL Server are the most wide-spread databases, something’s about to change. 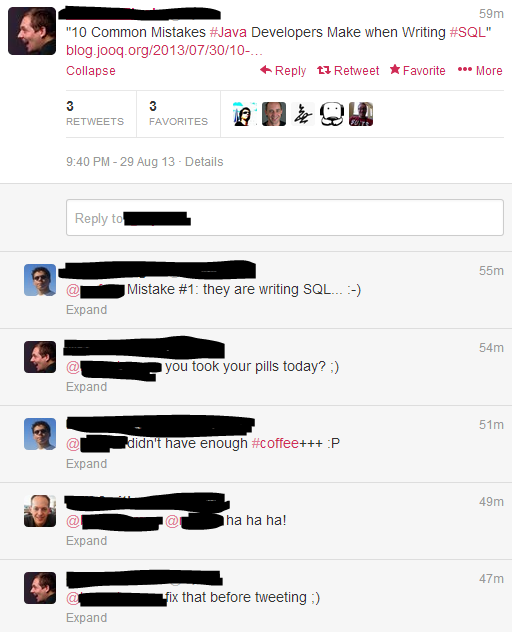 A follow-up article to the previous, very popular article about common SQL mistakes. Yes, there’s a lot to learn in this area. Thanks for reading our blog! We promise to keep you up to date with more interesting (and occasionally useless) content! On this blog, I’d like to share my thoughts about developing in Java and SQL, and my “middleware passion” jOOQ. jOOQ effectively combines complex SQL, typesafety, source code generation, active records, stored procedures, advanced data types, and Java in a fluent, intuitive DSL.